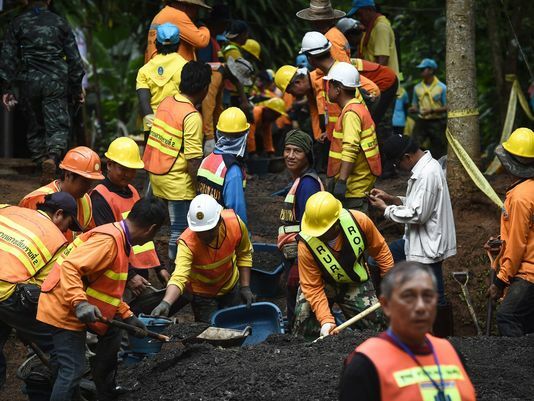 Four more boys trapped for more than two weeks in a partially flooded cave here were brought out Monday, raising to eight the number of youths rescued but still leaving four young soccer players and their coach awaiting freedom. He did not address their health status. Authorities said the four brought out Sunday were in good condition. Twelve boys, ages 11-17, and their 25-year-old coach hiked more than 2 miles into the labyrinth June 23, prompting a desperate search. They were found a week ago, but the heavy rains that flooded parts of the twisting array of tunnels have made their rescue a hazardous task. The rescue was put on hold Sunday night to allow rescuers to restock the cave with oxygen tanks. The effort cranked up again Monday morning local time, which was Sunday night in the U.S. The team hiked in after a soccer practice before heavy rains flooded parts of the cave, blocking their path out. Divers found the boys a week ago. More than 90 rescue workers from around the world have been laboring in and around the dark, twisting cave, with massive pumps being used to lower water levels. It is monsoon season here, and sporadic heavy rainfalls have added to the difficulties. A SEAL involved in preparations for the rescue passed out and died Friday, a sobering reminder of the mission’s dangers. Only parts of the cave are flooded, but most of the boys can’t swim. They have been outfitted with scuba face masks and are breathing from oxygen tanks. Two divers guide each of them through sections of the cave that are underwater. The first boy emerged at 5:40 p.m. local time Sunday, less than eight hours after the rescue operation started. Three more boys came out of the cave over the next two hours.